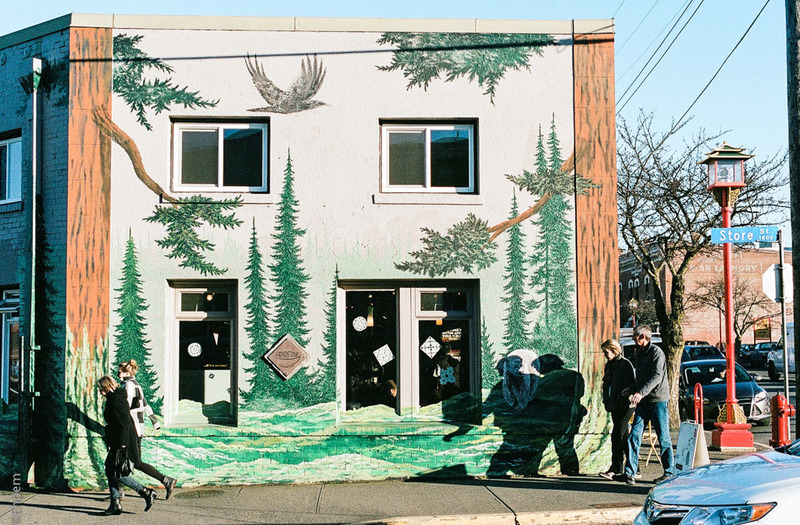 This mural is on the Grindstone Cafe on Store Street at the edge of Victoria’s Chinatown. The artist is Mario Labonte. The mural wraps around the corner of the building on the right. Canon EOS3, EF 50/1.4 lens, Kodak Portra 400. Bringing the forest to town, you might say! I like it. Every town needs more forest within. I like it too, it reminds me of places that I work, which are definitely not urban, or even rural. Beautifully done – I agree with Sherry that the people add a lot – especially, like you say, because of their shadows, which echo the dark windows and door. Thanks Lynn – I doubt I would have taken the photo without the people. Nice enough mural, but something more was needed for my interest. I really like that you included the pedestrians. lots of action both human and painted! That is quite a mural! Thank you Sherry. The mural really changes the building. I quite liked the building without, but this works too. It was the shadows that drew the attention of my lens though they do obscure a rather nice brown bear.